Today I basically spent my entire day working on Canada Photo Convention stuff. The great thing about that is that at around lunchtime, I headed into the kitchen and started to feel kind of guilty because I was really enjoying my day and should be working. The exact sort of feeling I've spent years trying to eradicate from my life. The thing was, I WAS working. I had been already since a phonecall woke me up at about 8:45, which was hours before my alarm was supposed to go off. In celebration, I ate all the leftover pizza from the freezer. Well, I would have anyway. But I specifically ate it in celebration. I made a good decision when I decided to stay with CPC, to do what my passion leads me to. In celebration of the concept I've lovingly titled Bring Your Moves to the Floor, I want to give a shout out to my very good friends Mark and Moira, whose passionate, creative zeal for the unusual has led them to recreate something intensely amazing - the ZebraCar. Before I ever met Mark and Moira, I saw the ZebraCar, and being young and foolish, I probably squealed. Nah, not true. I sqeal every time I even think about the ZebraCar. You know why? Because there's nothing like creativity run amok to make this world a better place. Spectacle. Irreverence where irreverence is due. Fun where you just have to have fun because life is too beautiful not to be filled with a desire to run rampant over invisible rules and attack the terrible disease that is Adultitis. I treasure my friends who do not suffer from acute cases of adultitis. And Mark and Moira are among the least affected by it. As Paul so eloquently said the other day after we talked to them, "They make me feel like my weird is normal." 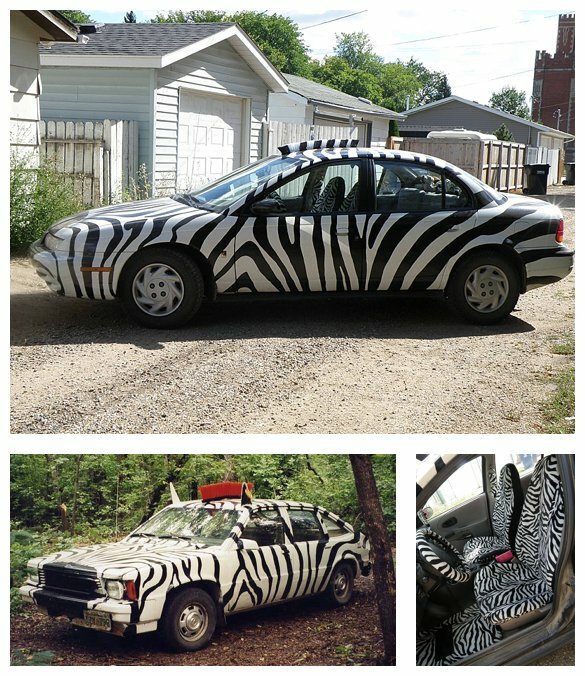 In case you've never been to my old hometown of Saskatoon, I'll introduce you to the ZebraCar. Or rather, the ZebraCar 2.0 and the 1.0 as I first saw it, as well as a little taste of the inside. Their reason for creating this animal: "We're not about to be lost in the sea of white cars out there, and we're not afraid of standing out in the crowd (or the herd). We hope our crazy art-car fashion-sense inspires other people to be creative with their vehicles, especially if, like us, they are a one-car, drive-it-till-it-dies, non-status-symbol family. Smiles are free and we love to give them via our goofy four-wheeled friend. This is the kind of thing I mean when I think of that concept they talk about in rap music: bringing your moves to the floor. In this case, the floor is the road, and the field of expertise is a fantastical art car. But the theory and the idea is the same. Bringing your moves to the floor is about not hiding from your passion, about striving for the best in a world that settles for the mediocre. It's about taking the road less travelled, to use an older frame of reference. The challenge of going to the end of your creativity, whether or not it alienates, to be real about who you are instead of hiding behind many masks for different occasions. It's about allowing only the healthy fears - like knives and fires as opposed to jungle gyms and bill payments - to be a part of your decisionmaking process for who you become as a person. I can't settle for less than this kind of loud. I want to bring my moves to the floor - in business, in faith, in morality, in art, in love. I don't want to live this life with just a little bit of anything. I'm the kind of person who has got to stand out, to find my vision and see it done. As I teeter on the edge of 29 this year, I remember that age has nothing to do with creative potential - if anything, the older you get the better your creativity, if you've been feeding it all your life. If you don't know Mark and Moira, you might not know that they're the same age as my parents, who also delve deeply into arts and crafts that give joy to others. So this is an ode to the ZebraCar. The epitome of what it means to be okay with standing out, being uncivilized, and achieving your potential as a creative being.